In chapter 2 of the book of Daniel, we encounter the twofold nature of a man. This is in part emphasized by the numbering of the chapter - which is the chapter number 2 - but also by the "second year of the reign", when the spirit is troubled. In short, "God created Man in his image, in the image of God created he him" (Gen. 1:27). The king Nebuchadnezzar represents here a fallen man, a man without faith but also he represents God the father. God is also a King as it may be well understood in the parable of the wedding banquet (Matt.22). Furthermore, the gospel was to the Jew first, and also to the Greek. (Rom.1:16) In like manner, the Jews were brought to Babylon during the first year and the everlasting gospel was soon preached upon the Gentiles, that is, during the second year. Every human has a twofold nature: spirit and flesh. Jesus Christ was born of the Holy Spirit and of the virgin. In order to be called a child of God, the relationship with Christ must be present. This is based through the Holy Spirit. If and only if we have the Holy Spirit we may actually be relatives to the King's son, Jesus Christ. A fallen man in unbelief does not have such a relationship but he is related to the spirit of the Devil instead. In like manner the Levites were of the tribe of Levi. They were figuratively the people of the elect, yet relatives to each other. Even today, being an ordinated priest doesn't guarantee salvation. However, the priesthood of the order of Melchizedek is eternal, simply meaning that the faith in Christ guarantees an eternal life. When the Holy Spirit dwells in us, we will receive the inheritance in heaven one day, because we're called sons and daughters of Christ - we're related via the Holy Spirit. This royal priesthood, the personal faith, is for both the men and the women, although the public office belongs to the men only. Bad conscience is a source of insomnia, bad conscience troubles man's sleep. Every fallen man has his time of visitation. Even all the people in the unbelief are called. The time of visitation is temporary. God the Father tries to wake up people from the sleep of sin. This is what happens to Nebuchadnezzar here, and this is what happened to the Pharaoh in Genesis when Joseph explained Pharao's dream. The dream of Pharaoh required work to be done, prefiguring the law to be fulfilled. Christ fulfilled the law. The work was described in the gathering of grains. However, the dream here requires no work since Christ already fulfilled the law. A fallen man, during his time of visitation, may consult an endless number of sects and churches yet failing to meet the figurative Daniel and his friends, meaning the true servants of God. These are the churches built by the men, even though Christ has declared "I will build my Church". This is the work of the flesh and this is why Daniel and his friends are not being called. With a carnal mind only those ungodly and unclean churches are called out for help. Read the Scripture: "No man can come to me, except the Father which hath sent me draw him" (Jn.6:44). On the other hand, God the creator calls the people in unbelief; those already in true faith are not being called. Daniel and his friends were true believers, hence left out. Christ said: "And he said unto them, Unto you it is given to know the mystery of the kingdom of God: but unto them that are without, all these things are done in parables" (Mark.4:11). Thus, the troubled king saw only parables he couldn't interpret. In like manner the Pharaoh saw figurative dreams, parables, when Joseph was in Egypt. God the Father had a plan for the salvation of the men. He gave the law and fulfilled it himself so that all who believed upon his Son, that is, believed the gospel, would live forever. The original language of the book of Daniel switches from Hebrew to Aramaic now. The Devil's churches, sects and heresies request to know the dream (figuratively the law), the underlying cause for the bad conscience causing sleeplessness. This is a mission impossible because these earthly churches don't even know the law of God, or do so partially only. This represents the current age, in which mortal sins such as contraception are widely seen as permissible acts. They have terribly altered the law of God according to their own judgments and customs. The Chaldeans, that is, the Gentiles and Devil's churches promised to tell the meaning of the dream (figuratively the fulfillment of the law) if it was first made known to them. However: "19 He sheweth his word unto Jacob, his statutes and his judgments unto Israel. 20 He hath not dealt so with any nation: and as for his judgments, they have not known them. Praise ye the Lord." (Ps.147) Only the true church knows the will of God and they are aware of it in their own language. In like manner, whereas the Chaldeans promised to interpret the law if it was made known to them, the Jews promised to obey the law before it was given to them on the Mount Sinai (Exodus 19:8). However, everyone, whether a jew or gentile, is judged according to the law when the time is up. God the father wishes everyone to be aware of the dream and its interpretation, that is, the law and the gospel. "For as many as have sinned without law shall also perish without law: and as many as have sinned in the law shall be judged by the law (Rom.2:12)"; poor he who knows not the will of God, poor he who misses his time of visitation! The Chaldeans, meaning the Devil's sects and churches were now expecting that the King would tell them his dream but the answer has no compromises at all. Likewise the law of God has no compromises to be made. Perhaps there were subsequent failures prior to this, as we read earlier that Nebuchadnezzar "dreamed dreams", that is, dreams in plural. Such is the talk with the endless number of earthly churches, they will not help in the process of getting a clean and pure conscience. They have no means for one's salvation. In the time of visitation, God the Creator may approach a man multiple times. The bad conscience wishes secretly that all sins would be forgiven and it gets exhausted with the Devil's army. Now gifts and great honor is promised. Indeed, fulfilling the law grants eternal life; but it's not possible for a man to fulfill it. Thus, the interpretation is needed. The interpretation of the law is the gospel. This is the will of God: he wishes that every man and woman would repent (Acts.17:30), he wishes that all mankind would follow him instead of the Devil. The devil's army wishes to alter the word of God. In this process they are real experts and masters in the sight of men. Many people turn to them as they promise salvation to people who live in sin. Living in sin and accepting sin is like touching an unclean thing. The uncleanness doesn't go away without the gospel, the living water. Sin pollutes the hearts of men. In the parable of the shrewd manager, the debt is made smaller and a great amount of friends are being made. Such are the churches of Satan: they make your sin debt appear smaller than it actually is. This is consent to sin. In response, they find many supporters because human flesh wishes to live a sinful life. On the contrary, through Jesus Christ all sins are forgiven, the complete debt burden is forgiven - in strong contrast to those who perform partial "pardoning". Fittingly it's written here: "They answered again", as the Israelites, after hearing the law, declared: "All the words which the Lord hath said will we do." (Ex.24:3) Remember the first time the Israelites promised to obey the law (Ex.19:8), before the law was even given to them. These Chaldeans had earlier received the command, which was to tell the King's dream and its interpretation. We're seeing a similar pattern here. The time of visitation is a temporary affair upon the unbelievers. The devil's churches know this of certainty because their master is the devil itself. Once the time is up the king would no longer need to be concerned with his bad conscience. A fallacious peace would ultimately enter his mind. This would eventually save the Chaldeans, or their earthly lives. This is the devil's doctrine: repent tomorrow, not today. It's of good advice to stop listening to the erroneous churches and sects. Ask them for purification of conscience, but if the conscience doesn't get any better, turn to some other. Don't tell them your cause of bad conscience - the fear of eternal punishment, the terrifying dream, or they may just assert that you haven't done anything wrong. In addition, they may be appear performing pardoning in words and works, but it has no effect. The Chaldeans are now being honest as they're left with no spiritual weapons. A man with a bad conscience should come into a conclusion that a man cannot fulfill the law. "12 They are all gone out of the way, they are together become unprofitable; there is none that doeth good, no, not one." (Rom. 3:12) Do not go after your works, you will never be saved even if your intentions are good. It's impossible among the wicked to generate true faith out of nothing. They have no means for one's salvation. The Bible appears too rigid and it looks like there's no way to obey the King and his commandments. The true church of Christ seems to be inflexible and ridiculous, something that should be avoided at all cost. Thus, Daniel and his friends are excluded by the carnal mind. Even the devil itself knows that those gods whose dwelling is with flesh alone cannot help. Those sects are of the flesh. An earthly king may declare all religions as useless pieces of magic. So far he has not consulted Daniel at all. There's nobody on earth who could fulfill the law, all of us are condemned (see Rom. 3:12). Only Jesus Christ fulfilled the law for us. Thus, the decree also concerns Daniel and his fellows. Here, in this Chapter 2, Daniel represents Jesus Christ. In other words, he's a type of Christ, not the real Jesus Christ, but a figure of the coming. "Behold the Lamb of God, which taketh away the sin of the world." (John.1:29). It's Daniel's work which saves the Chaldeans from the death penalty. Similarly Christ took away the sin of the world. 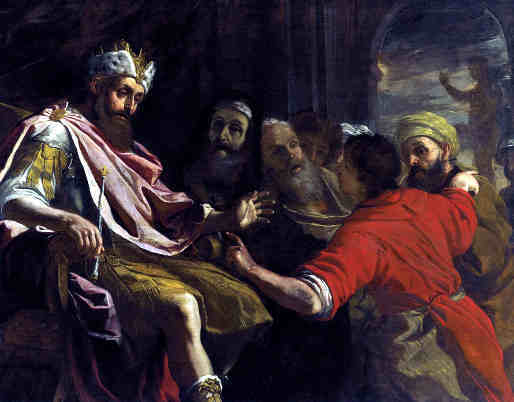 Daniel appoaches the King via Arioch. Arioch may mean a fierce lion. However, Arioch means a prayer here. Daniel talks to the King through a prayer! "The effectual fervent prayer of a righteous man availeth much (James 5:16)". Jesus prayed often. In Daniel 9:21 we see that an answer to a prayer may be closer than ever thought. Thus "Arioch made the thing known to Daniel", that is, via the prayer there might be an answer soon available. Please note that Daniel asks time so that he could show the king the interpretation. There's no request to ask time to show the dream also, but only its interpretation! Jesus Christ knew the law, but he was to fulfill it also. The King is merciful. He doesn't disregard the request from Daniel because he was not being heard before among the other Chaldeans. At that time, Daniel and his friends were simply excluded. Now, God the father is drawing Nebuchadnezzar towards him: "No man can come to me, except the Father which hath sent me draw him" (John.6:44). All other sects and churches are now being excluded instead. This is the work of God within a fallen man. Jesus made known his purpose on earth to his disciples during his public ministry and also after His resurrection. The will of God is to save all, not just the disciples and some others, but all the mankind. Without the faith in Christ we're all doomed. Daniel and his fellows didn't want to perish with the rest of the wise men of Babylon, meaning everyone should worry about his very own personal faith. Daniel's other name is now referenced. Likewise, God called Jesus his son. Fittingly, Belteshazzar means "prince of the king". Figuratively, the King calls Daniel his son. The question ("Art thou able..") is understood through the temptations of Jesus Christ: He "was in all points tempted like as we are, yet without sin." (Hebr.4:15) Thus, he was qualified because he was without sin. Now the king Nebuchadnezzar is mentioned by name. Last time he was mentioned by name was back in the first verse. God the Father knows all the secrets, so right here we stop referencing the king as God. Instead, this talk is directed to the king Nebuchadnezzar; now meaning the unbelievers, whose spirits are troubled. Likewise, the law and gospel were recorded for all the mankind - through the Bible. It's hard to believe the king Nebuchadnezzar was afraid of nightmares any more than you or me. It was not an ordinary nightmare but when God the Father starts to talk via one's conscience, the results are much, much different! The people in the numberless sects and churches preaching their own gospel only judges themselves. They will perish and will not be saved. God the father calls these people in his ways, God gives them times of visitation. Daniel was called, he was to cure the troubled conscience that had awaken. 32 This image's head was of fine gold, his breast and his arms of silver, his belly and his thighs of brass, 33 His legs of iron, his feet part of iron and part of clay. This is simply a figure of a sinful but righteous man. Indeed, the law declares all people sinful. This man has been called or invited, just like Cornelius (Acts 10) was called, so he's not completely made of clay. The clay denotes sin. This is the principal meaning, although there's other meanings as well - we'll come to this later. The righteous need often to hear the gospel. Peter wanted to be completely washed but that signifies repentance and the pious true believers don't need to repent from unbelief as they already believe, but rather, they need to wash away the sins that stick to feet like dirt does. This washing is done by confessing the shortcomings and trespassings and hearing the gospel. Who is this man? It's worthwhile to note that the secret is something rendered "in the latter days" (v.28), pointing into the future. This is Nebuchadnezzar himself in the end of the Chapter 4. The law points to Christ (Gen.13:15, Deut.18:15). In like manner, Moses, the law, brings people on the border of the promised land (heaven and the kingdom of God) from Egypt (this world). When your conscience blames you for your sins, you'd need to hear the gospel that cleanses from all the sins. The law makes you move towards the kingdom of God here on earth, the congregation of the just. The earthly kingdoms here on earth also remind us of God's kingdom where Lord Jesus Christ is the king. In this manner they point to Christ. This is different from democracy. Thus, the metals signify the dead, the righteous people who have died in faith. As may be read from Job.28, metals are mined from the earth. Similarly, people are buried in the earth. Lord Jesus Christ, the serpent of brass (Num.21:9) was buried in a tomb carved into the rock, and thus we read: "brass is molten out of the stone" (Job.28:2). The metals were also building materials for the temple, including iron: "And David prepared iron in abundance for the nails for the doors of the gates, and for the joinings;" (1.Chronicles 22:3) "You are the temple" contains both the living and the dead! Finally there's a stone that smote the image and became a great mountain. The tabernacle had no stones, but contained precious metals. The temple of Ezekiel (Ch.40 ->) appears to have no precious metals, but only stones. 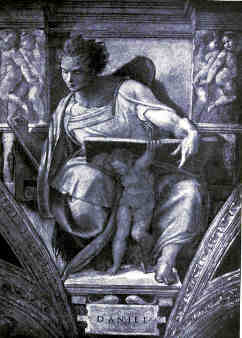 The tabernacle preceded the temple of Solomon, but the temple of Solomon preceded the spiritual temple of Ezekiel. The tabernacle and Solomon's temple were looking glorious inside - such is the kingdom of God. It looks like the worst place to be in the eyes of those outside. Compare the small temple of Solomon to the Great pyramid of Giza, for example. The other being a small in size, hardly noticeable and destroyed, the other still standing firm! Moreover, the gold overlying the interior is also personal - such is the faith. The Holy Ghost dwells in the believers, glorifying God the father. Yet, the world thinks the righteous people are just ridiculous, not even wearing earrings nor makeup! The fact is, the worldy people tend to glorify their outward looks instead! Just like the whore in the Revelation 17:4! All the biographies of the pious, their faith in Christ, stories of the wonders of the living God, truths, martyrs, are the gold and other precious metals. People come and go, that is, people are born and soon die but the memories of the righteous remain from generation to generation. When the memories glorify God, they are made of precious metals. Many such stories are found in the Bible. When the righteous die, many memories and biographies are forgotten. In other words, they are buried along their personal "temples". When this world ends, these memories cease to exist. In other words, "But the day of the Lord will come as a thief in the night; in the which the heavens shall pass away with a great noise, and the elements shall melt with fervent heat, the earth also and the works that are therein shall be burned up." (2.Pet.3:10) Thus, there will be no precious metals in Ezekiel's temple. Likewise, we read: "stone that smote the image became a great mountain". 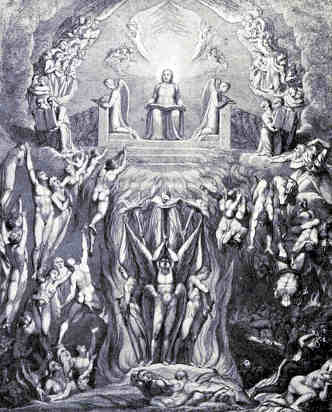 Note that the law will end as well, the terrible image is nowhere to be found, there will be no sin in heaven. The game is over in the final judgment. Those who die or have died without faith, will be in everlasting pain. They don't belong to the spiritual temple. Christ made known the law which was hidden, likewise the dream was unknown: all food is clean, He did not stone anyone to death etc. The law is spiritual and Christ himself knew what the law of Moses meant spiritually. Daniel signifies the Lord Jesus Christ. Now we stop the commentary here. Nebuchadnezzar didn't repent as we may read from the Chapter 3. However, some peace was brought into his mind by the knowledge of the law and the gospel. Today, the knowledge that there are some righteous people in the world even today may bring fallacious peace to many. They may quietly say "in the last days of my life I will repent", just like Balaam wished to die (Numbers 23:10), they're asking for more time for their times of visitation. This is how they start building the ungodly worship like Nebuchadnezzar started to build up the statue and its worship according to his dreams. This is a strong delusion. Posted Februyary the 19th, 2018. biblenanalyses.com texts are all public domain free for all to copy and utilize.